Allahabad is a bustling city with a population of 5 million people. It is a holy site of the union of three rivers and it’s locally called the sangam, the Sanskrit word for unity. Allahabad is located about 7 km from the township in Allahabad and is the site of the Kumbh Mela. The confluence of the three holy rivers of Hindu Mythology—Ganges, Yamuna, and Saraswati takes place at Allahabad. The Allahabad Kumbh Mela is an example of the undying faith of hundreds of devotees who surrender themselves to mighty river waters to wash away their sins. They do this by taking a holy dip in the river waters, which is said to free them from the vicious cycle of mankind and their sins. The festival is considered a congregation of Faith and Belief where people from all communities can come and take part in the rituals performed. The Kumbh Mela is the most auspicious time to take the holy bath to lead a pious life ahead. The age old history of Allahabad dates back to the Maurya, Gupta and Mughal Empires. There are many forms of Kumbh Mela and the different beliefs linked to them. Routinely, the Kumbh Mela is held every three years. Haridwar and Allahabad (Prayag) celebrate the ardh (half) Kumbh Mela, while the purna (complete) Kumbh Mela takes place every 12 years at four different places—Prayag (Allahabad), Haridwar, Ujjain and Nashik. The timings of the festival are essentially based on the position of various astronomical calculations and planetary movements. The Maha Kumbh Mela is celebrated at Prayag (Allahabad) after 144 years, which is after 12 'Purna Kumbh Melas'. Allahabad therefore holds most significance for the Kumbh Mela because both, the half and the complete melas are held here. This magnificent fete follows the story of a legend, which has its roots in Hindu mythology. It is assumed that during a wage between the gods and the demons for the possession of amrut (elixir) to give eternal life, a few drops of the elixir had fallen off the imperial pot to four places on earth—Prayag, Haridwar, Ujjain, and Nasik. The Kumbh signifies a pitcher, where its mouth symbolizes the presence of Vishnu, its neck that of Rudra, the base of Brahama. The goddesses are in the centre with the entire ocean inside it, thus encompassing all the four Vedas. The Kalash or the Kumbh is an integral part of any Hindu ritual and has vedic importance. 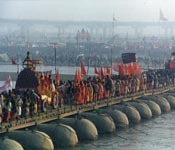 The astrological time for the Kumbh to take place at Allahabad is when Jupiter is in Aries or Taurus and Sun and Moon are in Capricorn during the Hindu month of Magha (January-February). The belief goes on till date and this time is of great significance to take a dip and to visit the place. The Kumbh Mela site or the sangam lies at the river banks where people come and take bath or take a holy dip. This time of the year brings them prosperity and energizes them to lead a pious life in the future. Apart from the ritual of a holy dip, people perform various temple rituals including havans (performed circling a fire place) to impress god. This time is considered particularly auspicious because it is believed that this is the time of the awakening of all gods. The Himalaya is considered to be the start of life. The holy rivers of India originate from here, depicting true life giving sources. Its clean and pious water helps you get rid of all your sins. The Kumbh is a congruence of all our cultures. It is the symbol of religious and humanly awakening. 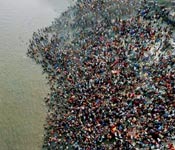 The Kumbh has the eternal flow of humanity. It signifies the flow of life until its end. Hindu mythology connects it to it as a source of all energy. The Kumbh Mela is celebrated at an extremely large scale and people from all over the country, as well as from all over the world, wait eagerly to participate in this historical event. The speciality of this festival is not only in the spiritual re-awakening but to see large communities gather and forget their social differences. The commencement of the Kumbh Mela brings many devotees to this place; some even come bare foot as a symbol of gratitude towards god. People walk hundreds of kilometres to reach this place. 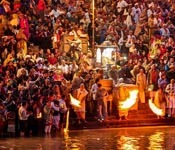 The rivers in India have always been treated as deities. The Kumbh Mela has millions of devotees who come here and not only take blessings from the temple god but also pay respect and homage to the four rivers here. The holy water is considered to be the nectar, which brings life and prosperity to human kind and its forthcoming generations.